This was MY favorite HAT that embodied all of her Southern Charms. The Gardening Hat. Down by the Shore Hat, with it's Seashells that sparkle in the Light. The Floppy Hat. Mom was always in Style with a Good Hat. That was her staple, her signature. You'd see her everywhere with one. As it comes close to Christmas and a New Year is upon us. It's like putting a new HAT on. I'm sitting at my little desk and I'm looking up at Mom's hat. She use to hang them on a door handle to the closet that was right by her seat at the kitchen table, she could just grab it if she got a quick visitor at the front door or if she felt her hair was out of place. It would be there if she was running out the door to go to "Tha STo", in her Southern accent! She had a hat everywhere in that house for every occasion. Her hats would be up in the closet as you walked in the door on the top shelf of some old phonebooks always ready for a quick grab. 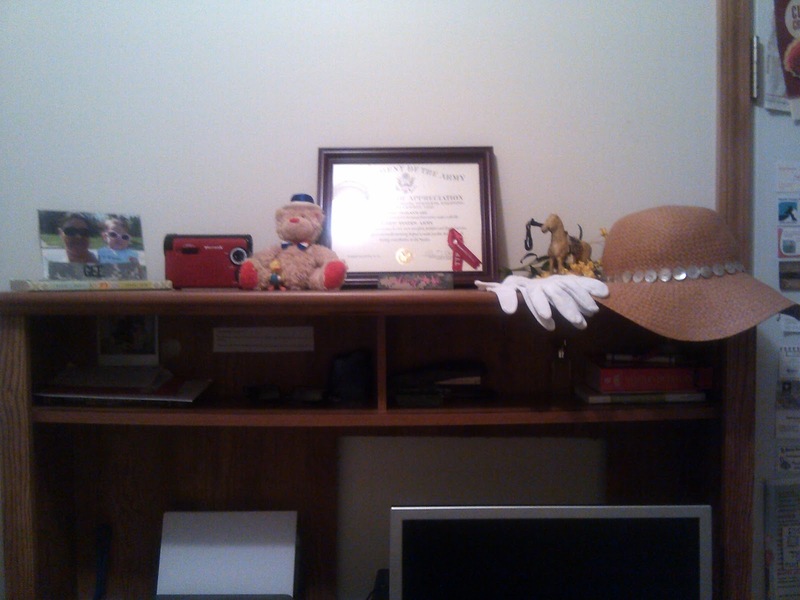 Layed across my bed in my "old room" for ready on Sunday morning, even on a Styrofoam head just to keep that Tam in place. When she passed she had old hat boxes from Hess's, John Wanamaker's. It was hard to let it go. Me and my sister Bettye, after she passed, Laid them all out in the Living Room we called the "Front Room",we weren't allowed to be in as kids, as her friends would stop by and look the hats over and choose what memory they wanted to keep. We wanted them to have something of Mom's. Hats were important in a Southern Lady's wardrobe they stood for different things. Work~ Grieving~Celebrations. IT's an inspiration for me, for starting over in a New Year. Daddy just sat quietly over the coming weeks..... as we were settling all of Mom's personal things. He was the Leader in Mom having so many Hat and Purses and her Pins. He spoiled her with them. Me and Bettye kept several but that was the last hat I saw Mom in, and Bay graciously bowed out to let me have my way. The other thing I think of the most is Mom's pin hats. She had plenty. I love to just open my box and glance at them. The hat pins never went out of style for Mom, she had them all around in different rooms just for etiquette. That's what a Southern Lady does. Mom at her Best. Our favorite. She went out with Style no matter what time of year or occasion. 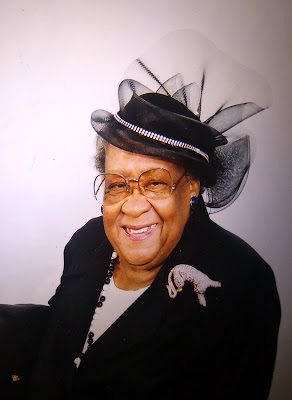 Her biggest moment for me, was when Mom stepped out in her Church hat. She knew how to wear it, she wore it well! and It didn't wear her. Church hats were my Mom's Crown and Glory! I was always so Proud. Labels: My True Roots. Notes To Myself. Steins Department Store. I wanted to share my trip back to Alabama. I had been pondering what to do with all my genealogical research. I had helped create the family website along with my cousin Lisa at www.ike-iveryfamily.org , I wanted to take it to another level where people could see the work besides me. I was always talking to them one on one trying to explain individually. I needed a format to keep the conversation going, find a visual where all can see the names and dates. I wanted them to see the "DASH". The Life in names "We Speak". So there I went and searched on the Internet for someone who specialized in documenting family history. I wouldn't have been satisfied with my 8mm video camera which is out of date! On a sunny Monday morning, October 3rd, 2011 I started my journey to Sweet Home Alabama. My trek, prior to all this, I took a lot of mental notes on index cards and did much preparation as I could, there was so much I needed to get done. Sometimes in our research one has to go to their Ancestral Place of Origin to get information that you just can't do over the Internet. On top of everything it was a personal journey for me also after my Parents passed in 2008 and 2009, their Souls are resting. It was a time of getting things done along with reflections. I arrived in Birmingham which is in Jefferson County, I went to the New Grace Hill Cemetery, which on a 1946 death certificate was called Mason City Cemetery. 3 weeks of trying to find its location and the history. I was there to locate one of Daddie's brothers, named Rev. Obie Lewis. Next it was on to Bullock County, Midway and Union Springs! This is where my earliest ancestor William 1812 and Minty 1834 (Ivey) Ivery where to make their roots. They seemed to start using Ivery after Emancipation even though I have both spellings on documents. At times during my visit I felt like was taking a step back into time. Not much had changed. If it wasn't for my family I would of had to stay in Montgomery, Midway is my Color Purple. I went to our family church Mt. Coney Missionary Baptist, which was founded in 1875. It's 137 years young! 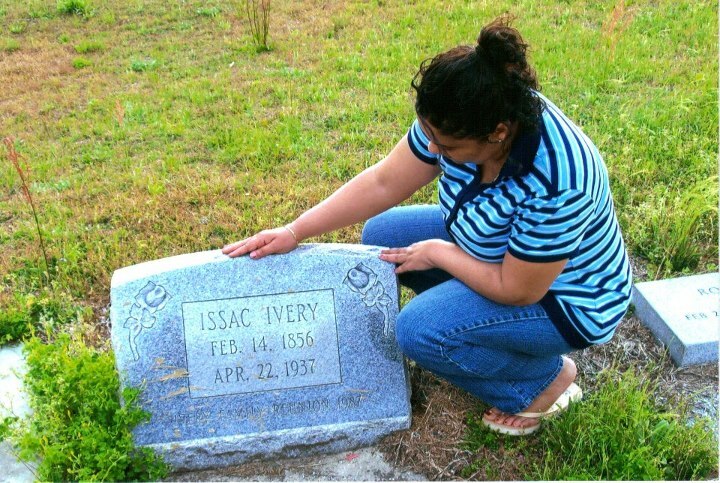 Ike Ivery is my Great Grandmother's father, I find it ironic Granny Eddie is buried right beside her father. Which was befitting from all the stories I have been told about how close their relationship was when they were living. I had written permission a month in advance prior to my arrival for video taping the church. Pastor Robbins was more than welcoming and very accommodating, he gave the history on the church and cemetery which a lot of my ancestor's are buried. I got to stand outside Bullock County Courthouse which houses a lot of my family documents and I got to spend 2 wonderful days just beyond belief research, I felt as if I was finally at home. I have so many letters and envelopes from the courthouse I was in what my Mom would say "Hog Heaven"! I was taking in every moment and just enjoyed myself walking around and going thru all the index and map plat books, marriage registers and old Union Springs Herald from all the way back! All the times I had been down home I was seeing it thru a different pair eyes this time. I thoroughly enjoyed the rich history and town. I rummaged thru a lot of books that you had to actually walk to flip the page over they were so big and huge. 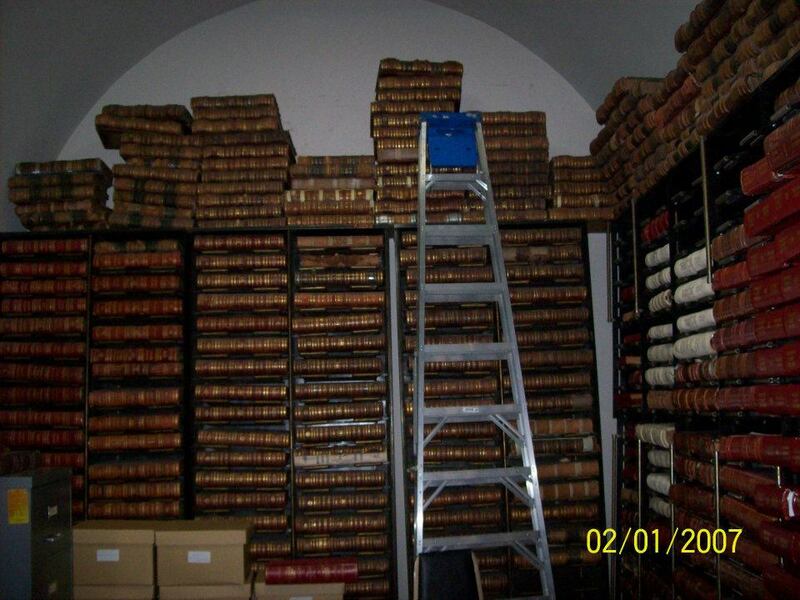 I saw books I wouldn't have been exposed to over the Internet or mailings, it was something you have to go there to experience. 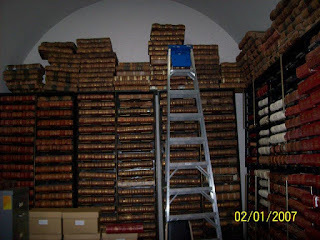 I was a dust bowl by the time the day was over, my calves were sore from climbing the ladder to get at some book tucked up high, I just had to see, even if it didn't have anything to do with my Ancestor's. I couldn't get enough. ADAH= Alabama Department of Archives and History was on my Bucket List. I finally made it! Beyond Words I shed a tear when I got there, how silly! After almost 8 years of seeing this man's name and corresponding over snail mail and numerous amount of phone calls and a missed visit in 2009 because of a storm, I finally got the pleasure and honor of meeting my Mentor Mr. Dean Spratlan, 72 who is also the President of the Bullock County Historical Society, which next month I'll officially be proud to say I am a Member of ! This man has taught me patience above all else in doing family research. He guided me, showed me things and shared so much with me over this time I will be eternally grateful. I really feel a kinship to him now that we have met, and he expressed the same to me also. That made me know for sure I was doing the right thing with my life and research. I got a lot of work done. 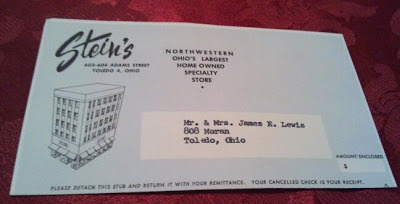 I was given documents on my family that I wasn't expecting. I learned things from all 4 of my Aunts over the ages of 80-95. The oral history they gave me was invaluable, all the talking over the phone was nothing compared to sitting and fellowshipping with them in person. Even one of my cousins just through a casual conversation led to finding out a family member had written a book which I ended up ordering on Amazon. 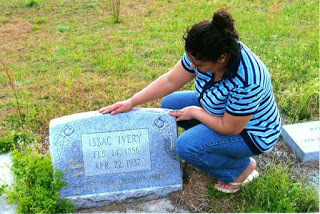 Issac Robbins published a 50-page book on Life thru a Black Soldier's Life in Midway, Alabama. Called: Glimpse of Providence: A Black Boy's Experience in Foreign Lands. Who Knew? Another highlight was when I happened to mention my own father James E. Lewis, he was mentioned in a book about all the soldier's in World War 2, in a book called "In Freedom's Name": The War Years 1941-1945 WW2 Bullock County Veterans. There was Daddie's name! Any person from the county doing war service is mentioned there in the back of the book which will be a genealogical gem for researchers in a book called Soldier's and Sailor's Discharge Records for Bullock County and it tells you what page they are on, so now I can order it from ADAH, another document to add to my Fathers history. A added bonus is I can give and share also if you have an Ancestor in Bullock County and you need to know the page number to order for yourself. Mr. Spratlan personally signed the book for me which he was a part of the research in 1996 when this book was written. I have been wanting to make this trip for a long time and came to a point in my research as I mentioned before where sometimes you have to make that trek and just pack up and go.It was not only good for my research but it did my Soul good as well. I needed to go walk the land, see and smell and get a feel for what life mighta been like for my Ancestors but also for the family who haven't left there. As I was leaving Alabama on Sunday after a whirlwind week for me and I was on County Road 82 which leads to HWY 110 out of Union Springs on to Montgomery a truck full of cotton was leading the way. At first I didn't know what it was blowing all over the place like snow. I realized it was cotton. I pulled over and took some home with me, along with a bag full of pecans from my 91 year old Aunt Sallie Bea. I also got some Alabama red dirt, that in the following week I took to Pennsylvania to place on my Parents grave. They were born and raised in Midway, Alabama, they might have been part of the Great Migration and left Alabama but Alabama never left them. As the sun was going down, I'm leaving town. I hated to leave. There will be another time. I started reflecting, I felt a inner peace like no other, like the Ancestors where riding with me. I started to see their faces in everything driving down that highway. What Sun was left on the horizon blaring in my eyes, I felt like my "People" where smiling on me from above. A song came on my Sirrius radio called "Secret Place": by Jai Reed and Bishop Love that was right on time and appropriate for my Documentary it was just what I needed to make it complete. 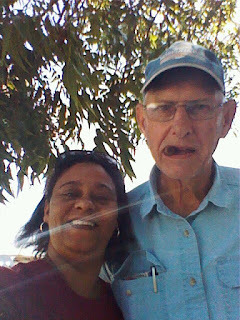 Finished Work on my Documentary can be found at: Granddaddy Ike to True's Story! I feel real honored to be participating for my first time and continuing tradition online, you should visit www.FootnoteMaven.com for further instruction on how you can participate also. 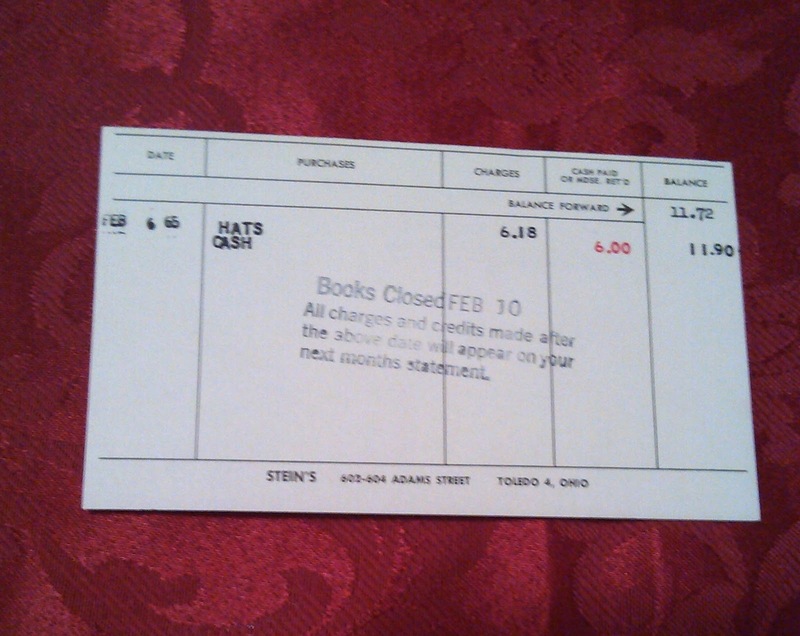 Footnote Maven started this online tradition. I always loved the TEMPTATIONS, they always put your mind and heart ready for the Season. Silent Night was always one of my favorites. 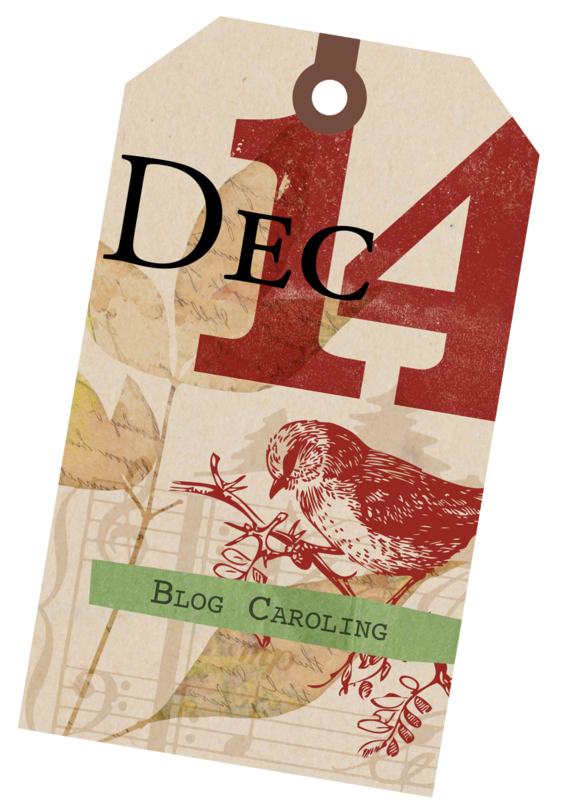 I hope you Enjoy my choice and have fun "Blog Caroling"! photo of a trip in which my Circle of Family Historians took. This was just a small ThaNk YoU NoTe on that Day. There it was ............a field full of cotton. It meant so many things to so many of us. Just like a small little PRICK on my finger,there was also a willowy COTTON brush on my heart at that moment. There it was, a sweet reminder from Our Ancestors, of the blood, sweat, and tears, all those steps by steps, one by one, foot in front of the other, stooping low, back bent, to remind us how far we have Come and Lest we Forget! Naturally one of my Sister's said the quote from the film by the actress who played Shug Avery: " I think it pisses God off when you walk by the "Color Purple" in a field and don't notice it". Well that's what happened that week this original photo was shown, we made sure when we saw the Color Purple in the field, we noticed it! We didn't piss God off! or Our Ancestors! I Thank You! Ancestors above. For sending that sweetness to us all in one small detail in a photo that kissed our souls in only your way! You've done your Work, Well Done. We will do the Tending now. With All our Heart, Your Descendants. I OFTEN WONDER..... about "1870"....... just 7 years after the End of Slavery. It's the 1st Census most "Black Folk" are to be counted as citizens. I've been researching my Family, both sides of Me for 13 years now. I feel like I only have a smidgen of it done. The enormous task is a masterpiece of our lives that never is completely done. It's all done with a labor of love. As I stare at the * 1870 Alabama census that my SLAVE Granddaddy Ike first appears on he is 17. Born February 14th, 1853 according to his official death certificate in 1937. He is still living at home with his sisters Rosanna and Isabella along with their Parents. Then I take a glance, I look at Pennsylvania's 1870 census and see my White Grandmother Rosanna, same age as Ike of 17, living with her Parents. She is always FREE. They were both 17 in 1870. Grandma Rosanna was born on April 3rd, 1853. 115 years later, her Granddaughter True would be born on that same day in 1968. The contrasts in 2 lives so far apart and yet oh so close, thru one child. I wonder if Granddaddy Ike and Grandma Rosanna would meet just half way somewhere? Being kind and respectful of one another and just having a talk abt the days to come in the future and what their lives where just a few short years ago. I know he wouldn't be able to just come upon a White Woman and talk. He would have to bow and remove his hat and hang his head low in reality.There would be a chaperone or White man accompanying her. But just for a moment in time, away from all of the ugliness, a meeting of respect between two lives "Crossing Paths". I want to imagine what that conversation would be like? Just "supposing" in my mind. Would she know all of what Granddaddy Ike had to go thru being under a White man's control like animal chattle just for the color of his skin? Being mistreated and to go thru it all for his children's children's children's wouldn't have to? I know he would be considerate and thoughtful of her being a Woman. Having just about no Rights herself, with the attitude of staying in her place, just to be seen and not heard. Being barefoot and pregnant and the other half of her life always taking care of children. Was she truly able to realize and make her dreams and hopes come to fruition. It's 2012 and that Question is still trying to be answered. I OFTEN WONDER.......If Granddaddy Ike and Grandma Rosanna met together this would have been my "Coming to the Table" moment, just for me. Talking abt days gone by and what is to come? Would they smile a while and talk over some sweet southern tea? I just "suppose", When all this hurt and shame is over and they are gone and can no longer be here to share and talk, and to think on a True moment that they have "SHARED" that Grandbaby True Ann? What they would of thought if they could of known and seen that I was coming? I'd like to know in my heart that they had some of these thoughts. That is what they have in common! THEIR common bond! Not so many differences at all. That the baby in 1968 would tie them all together one day, with the realization that all their hopes and dreams are on that "SHARED baby"? It's not the COLOR of our skin, but the BLOOD that runs thru her veins, is from "Former Slave to Free White Woman". * Source Citation: Year: 1870; Census Place: Ridgely, Bullock, Alabama; Roll: M593_4; Page: 271B; Image: 545; Family History Library Film: 545503.